Madison Bennett, one of Marketo’s Fearless 50 marketers, shares his advice for being unafraid and operating more efficiently as a marketing team. Earlier this year, Terminus’ own Madison Bennett was named as one of Marketo’s Fearless 50. As marketing operations coordinator, Madison helps manage our marketing tech stack and workflows, spending his days in tools like Salesforce, Marketo, and Terminus. We’re an ABM tech company, so it’s no surprise that we take an account-based approach to marketing. The ops team is the backbone of our ABM operation. They’re in charge of identifying our best-fit accounts, segmenting targeted lists, building marketing campaigns, and measuring the results of our programs — fearlessly. This is one of our core values at Terminus. We were so proud to see one of our own on a list of marketers who exemplify what it means to be bold, brave, and fearless because this value is so important to us. But what does it look like to be fearless in marketing? Madison, who joined the Terminus team in 2016, describes it as being unafraid to challenge people and processes. It’s about taking a step back to ensure you’re not just going along with what people say if there might be a better way of operating. It’s about having the courage to speak up when you find that better way. When you’re fearless in your work, great things can happen. You grow in your wisdom and experience because those things come with making mistakes. How will you ever know something doesn’t work if you don’t try it? Innovation is all about trying. We have to be willing to try new techniques and new technology if we’re going to keep up with (and stay ahead of) the market. If you want to be the best, you have to innovate and iterate and not be afraid to make a mistake. What does being fearless look like in practice? Let’s dig into an example. In Terminus’ early days, we were a little loosey-goosey with the accounts we were targeting. We were new to this whole ABM thing (and so was everyone else), so we weren’t using data to its full potential. We were playing it safe, using legacy technology and our CRM to uncover the accounts we wanted to turn into customers. It worked just fine, but we knew there had to be a better way. Enter a fearless new formula for account-based marketing: fit + intent + engagement. Today at Terminus, we use fit, intent, and engagement data for target account selection, dynamic prioritization, and smart campaigning. Fit: Fit is the basis of target account selection. If a company isn’t a good fit for you, why spend any of your resources going after them? It’s critical to understand your ideal customer profile, but it’s not just about firmographics. You need to consider technographics, geography, and any other factors that indicate whether a company can be a successful, long-lasting customer. Intent: Intent data shows what people are searching for and consuming on the internet (not just on your website). It’s more than just a Google search; we’re looking for activity like third-party content downloads that indicate interest in a solution like ours. By using Bombora’s technology to automatically surface when an account’s intent is surging in comparison to their past activity levels, Madison and team can prioritize accounts that are already in-market, even before they ever visit our website. 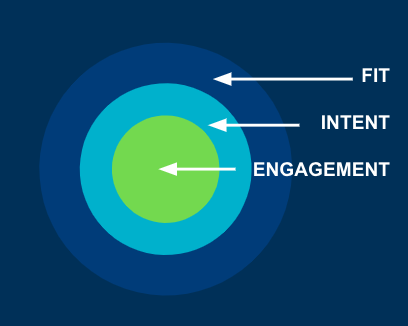 Engagement: Engagement refers to any activity with your brand, online or offline. By rolling engagement data up to the account level, you can understand and act on this response and behavior more intelligently. Ideally, you want to focus on high-value activity. For example, prioritize companies that spend time on your product webpages more than those that visit high-level blog posts because it indicates a more meaningful level of engagement. Using this formula, we can uncover the best-fit accounts at the right time. And it all started with our marketing team realizing there was a better way to do things. There was no roadmap to follow, so we created our own — and it’s now become industry standard, which is incredibly exciting. Sustaining fearlessness in your everyday work can be challenging. When is it worth it to take a risk, and when is it better to go with what’s tried and true? But being fearless doesn’t always mean jumping off a metaphorical cliff without a parachute. There are subtler ways to practice fearlessness every day. Play with technology. When you hear about something new, why not take a demo? Try it out and brainstorm how it might help your team reach your goals. Or, rethink how you’re using your current technology. Are there creative ways you can use a tool beyond its intended use case? Consolidate. Sometimes there are just too many tools and processes. Instead of going along with what’s been done for years, think of ways to consolidate your tech, simplify your workflows, and do your job just a little bit better every day. Prepare a solution. Being fearless means not worrying, “Will I break this?” Instead, ask yourself: “If I break this, what are my next steps to fix it?” Take risks, but make sure you have a solution ready in case your idea goes south. Fearlessness doesn’t always involve adrenaline. We can be fearless every day. How will you take the keys to the Ferrari today?